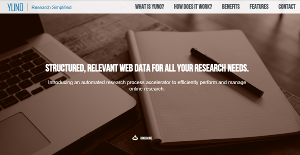 Yuno is a browser-based research acceleration tool designed to speed up the online research process for its users. The system makes it easy for users to obtain, examine, and use web data in the most efficient way possible. As Yuno is browser-based, there is no need for users to set up any hardware or install any software. No coding and no maintenance required to run this application. With Yuno, users are able to access and take hold of the most accurate, up to data web data wherever and whenever. Speed is of the essence and by automating the research process, Yuno helps its users fully optimize web data and use it in their applications. In this modern world, accurate and reliable data spells the difference between success and failure. But it is not just about getting the most precise information off the Internet. That is just half the battle. It all boils down to the combination of speed and accuracy. Research these days should be built on accurate information obtained and verified in the quickest way possible. That is where Yuno comes in. This browser-based research tool is designed to speed up the research process and help users gather, analyze, and utilize the information they get so that they can make smart business decisions and steer their companies forward with data-drive strategies. Yuno automates the online extraction process of data, which results in its faster retrieval. As the process is automated, researchers don’t have spend significant amount of time to look and verify large number of resources. The combination of web crawling and web extraction facility in a single product helps user search for relevant info and extract it using a single platform. Thus saving him time and effort. Yuno comes with an intuitive GUI for quick learning of product usage with minimal effort(10-15 minutes).This helps first time users learn the usage easily and motivates them to continue usage of product, and recommend it to others. Researchers will appreciate Yuno’s easy setup for extracting web data from multiple websites at a single instance with data delivered in CSV and HTML formats in email inbox. What Problems Will Yuno Solve? Scenario 2: A manufacturing firm wanted to track the tenders released by government for their projects.For this purpose YUNO was used to setup the automated extraction from the websites on daily basis. Any new tenders released were being tracked and the information provided to the manufacturer via daily scheduled emails. If you are interested in Yuno it might also be a good idea to examine other subcategories of Best Business Intelligence Software collected in our database of SaaS software reviews. There are popular and widely used solutions in each software category. But are they automatically the best fit for your enterprise’s specific needs? A trendy software application may have thousands of customers, but does it present what you require? For this reason, do not blindly shell out for popular systems. Read at least a few Yuno reviews and mull over the aspects that you want in the software such as the price, main functionality, available integrations etc. Then, shortlist a few solutions that fit your needs. Check out the free trials of these platforms, read online comments, get clarifications from the vendor, and do your research meticulously. This exhaustive homework is certain to aid you choose the most excellent software platform for your company’s specific needs. How Much Does Yuno Cost? We realize that when you make a decision to buy Business Intelligence Software it’s important not only to see how experts evaluate it in their reviews, but also to find out if the real people and companies that buy it are actually satisfied with the product. That’s why we’ve created our behavior-based Customer Satisfaction Algorithm™ that gathers customer reviews, comments and Yuno reviews across a wide range of social media sites. The data is then presented in an easy to digest form showing how many people had positive and negative experience with Yuno. With that information at hand you should be equipped to make an informed buying decision that you won’t regret. What are Yuno pricing details? What integrations are available for Yuno?